It seems like, before this past Christmas, we were talking here at least fleetingly about the possibility of the Maple Leafs making the NHL playoffs this season. That dream flashed before us despite a roster that was clearly built to lose. 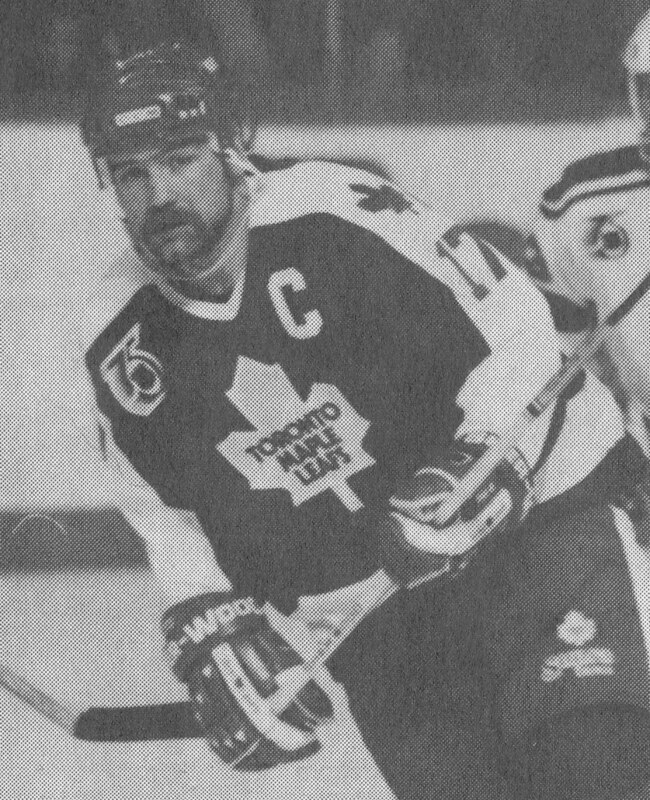 The very thought that the Leafs could hang in long enough to make a playoff run seemed to demonstrate the impact head coach Mike Babcock was having on his talent-thin roster. But as the season winds down and the real-world NHL reality strikes, we find the Leafs in last place in the overall NHL standings. There will be no playoff action in these parts yet again this spring. Now I realize that for many Leaf fans, this is actually the situation they have been dreaming about for years. The idea of being in a position to (lottery permitting) actually draft the best draft-eligible player available in the world is enticing. 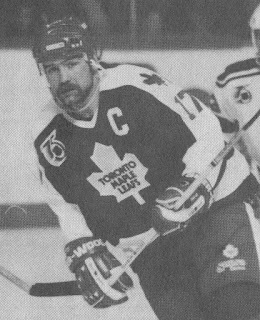 I stand to be corrected but off the top of my head, the last time we “earned” such a luxury was in the mid-1980s (for those too young to remember, we finished last that season in the midst of the never-ending Ballard years...) The Leafs selected Wendel Clark from Saskatoon in the Western Canadian junior loop. That turned out pretty well overall. Clark was often hamstrung by injuries in his Leaf years, and he returned to the Leafs throughout his career almost as often as Billy Martin managed George Steinbrenner’s Yankees. But at his best (such as the playoff series against the L.A. Kings in the spring of ’93…wonderful memory), he was a hockey force, a rugged power forward who could change the tempo of the game with his shot, big hits—or fists. If you make the right pick at number one in the draft (Denis Potvin, Gilbert Perreault are first overall picks that come to mind from my younger years...Crosby, Ovechkin, Kane, Tavares and Stamkos in more recent times), it can make in a difference to the future of your franchise, no question. So yes, the Leafs are in the driver’s seat, in a sense, heading to the draft. But is that, along with believing that Shanahan and Lamoriello will be able to give Babcock what he needs to build a consistent winner, enough to make you care again? Going back over the last few years, we often spoke here at VLM about the things many of us thought the Leafs needed: leadership, team toughness, top line centers, an actual team “identity”, etc. We have a new coach, and entirely new management team, and a ton of new players. But are we actually significantly further ahead than we were three years ago when it comes to those needs? Setting aside who the Leafs may be able to draft in June, when you look at the current prospects the Leafs have—and many have already spent at least a bit of time with the big club—do you believe this is a group filled with difference-makers? In watching Nylander, and as good as he appears to be, I wonder if he is a future first-line player in the making, a true star, or just a really nice player. After all these years following Kadri’s career, I remain ambivalent with regard to whether I see him as a player the Leafs absolutely have to keep as they look to become a legitimate contender. I have no clue where we are going with our netminding. Bernier is sort of the guy now, and they are giving some of the youngsters a shot as well, with Reimer now long gone. But I don’t know what the organization is really thinking when it comes to our goaltending. Are you convinced Morgan Rielly will be the superstar defenseman most of us thought he would become? He’s still very young, at 22 and presumably will continue to develop before he hits his prime years. But will he be the guy who leads this team out of the hockey wilderness? While on the subject of defense, I don’t think we really have a stable of defensemen (here now or in the system) who can lead the Leafs to a much higher spot in the standings next season. It’s clear there is a lot of building still to do in terms of what the roster needs. Maybe the thing that I’ve found most noteworthy this year is that the roster was clearly built to lose this season, perhaps even achieve what the club has “achieved”—ensuring a top draft pick. But as importantly, a few of of the low-cost free agent veterans they signed last summer/early fall have turned into some pretty good draft picks. We have a number of second-round picks coming our way starting with this year’s draft, and for the next couple of years. If the Leafs hit on some of those picks, that part of the plan will have been well executed and will indeed help us for the future. As I often have written here over the years, we all tend to look at the same picture a bit differently. Some Leafers are heartened by what they see as a bright future for the team under current management. Others are less hopeful. From my perspective, I think it is unfortunate that this franchise has once again had to take so many steps back and to continually rely on this notion of “building for the future”. That may eventually work, and if it does, hey, the wait will have been worth it, I suppose. But I much preferred the early-mid 1990s and especially the early 2000s, when we were a tough, competitive team every year and we could identify with a number of the players over a period of years (Sundin, Cujo, Kaberle, McCabe, etc.). Now? Forget talking about a Stanley Cup—heck, we haven’t won a playoff series since 2004. That’s an awfully long time to talk about the future. Unfortunately, this season has seen me lose a lot of my interest when it comes to following the Leafs. I just haven’t mustered up much interest in watching the team. Back in the days when the Leafs were truly competitive, this time of year was special—Leaf flags everywhere, fans in cars honking their horns, people who weren’t even big hockey fans talking about the next Leaf playoff game. No longer. As much as it’s nice to believe that this management group will get it right (after the last few administrations, post-Pat Quinn, saw a lot of starting and stopping on their watch), despite the presence of Babcock, Lamoriello and new players, for me, the Leafs have lost a lot of their like-ability in recent times. It’s fine to take pride in the fact that the Leafs have worked hard this season, but I’ve always believed that is the very least we, as fans, should expect of the players who wear the Leaf crest. That’s a pretty low bar. I nodded along with all of your points, Michael. As a long-time fan, like yourself, I'm beginning to feel I've "seen this movie before". I've followed the team's progress over the season, but was never really invested in it. I feel as if I'm watching an experiment, and waiting to see if the petri-dish results will be as predicted. I feel it's ironic that the ACC sound system plays "Won't Get Fooled Again" when the Leafs take the ice. And doubly so since the song was originally done by The Who, which is how I think of our lineup many nights! (I guess it's better than something by Ten Years After...) Maybe next year it will be Time Is On My Side! But I digress. To your first question, I think the answer is a qualified "yes". It seems as if the identity of a team that's fast, works hard, and doesn't give up is being established. Nothing wrong with those qualities! But I don't think we're appreciably a tougher team, (though a couple more Komarovs and Soshnikovs would help), and I don't yet see the leader we need. We don't have #1 center or goalie. We don't have even one feared scorer. I think our defensive zone play has improved a lot this year - Gardiner seems a lot smarter this year, and Rielly has certainly established himself. I think it's too early to tell about the difference makers. I've seen a number of Marlies games this year, and they've been fun to watch, but we all know Junior success doesn't necessarily translate into NHL success. I'm already concerned that some of our key hopefuls are too small - can Soshnikov or Brown take a full season of the pounding they'll get in the NHL? I have my doubts. Nylander looks like he has great "vision", but he's not big enough to be dominant - as a center, anyway. And, like so many Leaf teams of the last ten years, his talent won't matter if he doesn't have line mates who can't score, or at least play at his level. Kadri has been getting lots of praise for upgrading his game this year. It's another "wait and see" for me. But I do think he's a more complete player than he has been in previous seasons. Netminding is another big question. I haven't seen either Bernier or Sparks look like they're bona fide #1's, but who knows? Can Bernier handle the pressure of games that really matter? Can Sparks develop into a starter? Another "wait and see". I do have high hopes for Rielly. He'll never be a hitter, but his game does seem to have grown this year. I'm looking forward to seeing his play next year. It's difficult to judge our defence - there've been so many changes, and young guys trying out. Marincin has been a pleasant surprise, Corrado is that Leaf rarity, a hitter, Valiev... well, yet again, it's "wait and see" for me. With the picks over the next few years, the oft-repeated dedication to building a winner (what team doesn't say that? ), and the apparent improvement of certain systems, it's possible we'll approach competitiveness in a couple of years, and be a playoff contender in 3 years or so. It will be a fun ride for younger fans, to be sure. But for me, this year has been about supporting team that wasn't much better than an AHL team. I believe that top-level pro sports is about winning, not about teaching. Somehow, fans seems to be OK with watching a development team for another year or two. I'll watch, too - but my decades-old fanaticism has waned almost to the point of disinterest. Another year like this one, and I doubt I'll stick around. Thanks Gerund O'- we are very much on the same page. I agree that we will absolutely have an identity under Babcock. But we lack, as you well note, certain key ingredients that most really good teams have- at least right now. My guess is Rielly will play in the upcoming World Championships for Canada (and later in the World Cup, right? ), which should be a tremendous experience for him. Maybe Gardiner will get a look from the U.S. squad. Building a good team takes time, yes. But as we know, in sports there are no guarantees that the end result will be the desired outcome. Thanks Gerund. "…the Leafs needed: leadership, team toughness, top line centers, an actual team “identity”, etc...are we actually significantly further ahead than we were three years ago when it comes to those needs?" Could be either, we can use both, but his AHL numbers say he will be very good, probably great. I have no problem with him staying. He competes, rarely takes a night off (good example in that respect) draws penalties at elite level. Don’t worry, we have all of next year to figure it out. Sparks is coming along fine for his age…many forget he is still only 22. Yes or very close. He is among the best of his age group…not Ekblad level but the next closest tier. Rielly, Gardiner, Carrick and Valiev (only 20 years old ) are a nice start. Neilsen and Dermott are coming down the pipe. A future veteran UFA like Jason Demers or Mark Edouard Vlasic could make this defence quite good. Look at what Johny O’Douya did for Dallas this year. I have been focusing on the Marlies, which are the future Leafs. They have been terrific and exceeded expectations at every step. In the AHL they have looked almost like an NHL team .800 winning percentage at times. They will probably be AHL champions. I was dying for the Marlie kids to get a chance and now they have…and they are winning, many are immediately better than the veterans they replace. The last part of the year has made up for so much that I have rarely been happier. We will be a fun team for years. In three years, Leaf fans will be looking at the present before them and probably be ecstatic. Good to hear from you, DP. There's no question the organization has built a stronger pipeline. And Babcock seems to be the guy who can develop a roster. I have written in an earlier post about my optimism towards our new Leaf structure. I've been watching the Leafs since the late 60's and I don't ever recall the team being structured with so many management pieces. Elite, intelligent leaders! I wouldn't of been impressed by this pre'cap' era but now I think the organization has finally learned how to use it's financial might towards buulding a highly competive hockey team. As with most of your Leaf fans, I've suffered through many depressing seasons. This season feels like there is more to it than blarney promises and exaggerated talent evaluations. Agreed about finally having a smart front office. Things like leveraging having an AHL team in the same city and manipulating the roster to eke out extra cap space. Wasn't there an incident during the last regime where the "capologist" Loiselle didn't realize they couldn't activate a callup because of not having enough cap space? Or things like drafting a bunch of high ceiling skill guys. The previous regime crowed about spending 1st rounders on players, who at the time of drafting, were known to have CEILINGS of bottom 6 forwards or bottom pairing defensemen (e.g., Biggs, Gauthier, Percy, etc.). There's a bunch of other things, but yeah, it finally feels like we have hockey guys in the room who have skills that translate to building a sound foundation and organization. Not just guys who have been ex-players, so it is assumed they can build a team. You need a hockey background, but a bunch of other skillets of the managerial, interpersonal, analytical varieties. In the previous regime, it was assumed every actor/actress could be a director or a writer. Every construction laborer could be an engineer or manager. etc. Hi drgreg- Thanks for chiming in! You share DP's enthusiasm for the future. And it may well be that the current management group has established a program that will identify players with legitimate high-end potential- and standards that they expect to be met. Good to see you share your thoughts again Michael. I know it has been hard to get excited about games never mind writing about it hehehe.. I am of the mindset in that I have always felt you build an organization from the top down and the "culture" we hear so much about has to trickle down from there. Too often media writes this team is missing leadership on the ice so the culture is bad. That is hogwash to me. I have played at a reasonably high level..admittedly back in the day.. but the captain was the go between and the messenger more than the culture setter. Once the culture comes down from upon high good on ice and locker room leadership then helps build it. And I firmly believe the management group that Shanahan has built throughout has a chance to succeed. No guarantees but a chance. And let's face it looking back over the last 10 years that wasn't there. So one could argue that this is perhaps a different way of how they are setup, they got the coach first, no real defined GM for a year, then bring in a GM who has loads of experience but lots thought the game had passed by.. and I wondered about the old GM part at first for sure but now believe that is more to help teach the others the experience part to go along with their current knowledge. As the old theory goes.. the definition of insanity is doing the same thing over and over and expecting different results. Shanahan certainly must subscribe to that theory. DG's comments about the draft picks are spot on for me as well. Burke always wanted size over skill. If he was in charge we would have had Nick Ritchie over Willy Nylander without any doubt. Nothing wrong with Ritchie but Nylander for me has the chance of a much higher upside. Draft skill and fit the other parts around through trades and signings. I like it and look forward to seeing how this meshes over the next few seasons. You raise a very good point about Lamoniello, Pep. I think a lot of us wondered (acknowledging how successful he was in Jersey) if he was the right guy for the Leafs, and also whether he or Shanahan would be calling the shots. But as you note, Lamoniello brings tremendous experience that should only benefit the rest of the management team, regardless of how long he stays on the job. I think you're right- the organization now has a chance for sustained success. My only note of caution: how the kids are showing now may be very different than how they perform two years from now. It's difficult to gauge what their potential is playing games that don't reflect the pressure of a playoff race. Thanks Pep. There is no question about your caution point Michael. And Babcock himself has said a couple times in post game scrums to be careful about how much stock you put into the kids games when they come up and play their first games at the end of the season. Everything is new and fresh and they are FULL of adrenaline and excitement. It's nice to hear from you finally. I come here because I always find a perspective that is different from the general same-think that's been plaguing the blogosphere. Usually, and again this time, I find that you offer a more nuanced and historically-aware point of view. I really appreciate your perspective on this year's Leafs and couldn't agree more with your reminder that this team still doesn't have they key elements for success - first line centre, a stud #1 defenseman, and I would add, a starting goalie. To touch on your previous post - I think Reimer was our only goalie who had a chance of being no. 1 but even he was, in my eyes, short of being that good. He was plagued by injuries and media-created headaches and it's been pretty clear for a while now that he just won't be able to survive in Toronto. Bernier is just not that good - he's also too small for today's NHL. He may get another season to prove himself but, seeing as his signing was itself a leap of faith by the previous regime, I really don't see this management group putting too much faith in him. If there's one thing we know for sure about our current GM it is that he makes having a top no. 1 goalie his priority. I would be very surprised if he didn't trade for/sign his 'guy' in short order. I have no idea who it will be but I would be willing to bet that 'the guy' will be of the order of Schneider or Brodeur. I'm actually pretty excited about the future of Leaf's net - it's kind of like looking forward to opening the gifts on Christmas day. Nylander and Marner look to me like they will be as good or perhaps a bit better than and good replacements for Bozak and Kadri, but they don't strike me as dominant first-line centres of the order of Crosby, Kopitar or Towes. Our chance of drafting Matthews is 1 in 5. Our chance of drafting 4th is 50%. Is Matthews a first-line dominant centre? I don't really know. Stamkos is really good but I have my doubts as to whether this analytics-driven front office will be willing to dish out the money that it will take to sign him. I also have my doubts about whether Stamkos is good enough and healthy enough to take that role of the true first-line centre to lead us to the Cup. Rilley is not and will not be Shae Webber or Eric Karlsson or PK Subban or Drew Doughty. And neither is Jake Gardiner. Poaching Subban from Montreal or Headman from Tampa should be the management' top priority. If anyone can get it done it's Lou. He has the assets and the cap space to do just about anything at this point and that is, perhaps, the key to the excitement that I feel about the future. There's a lot more work to be done. But the people in charge are indeed the cream of the crop, and, even more importantly, are in position to do their work in peace, supported fully by the ownership and the fans. It was hard to watch Mike Babcock lose this year - I cannot imagine how hard it was for him to be facing the media night after night as a coach of the worst team in the league. I hope this only fuels the fire in him. Like you, Michael, I am done with losing. I cannot take any more of this. I really, really hope the Leafs start trying to win. Next season is the centennial season. Next year is the 50th anniversary of our last Cup. If we actually tried to get into the playoffs next year I think we may be able to do it. Once you're in anything is possible. It's a perfect opportunity to start trying to win. Hi leafdreamer- thanks for the good words and your comments. You rightly point out that Lamoniello knows we need to have outstanding goaltending going forward. How that happens, I don't know. But yes, he will make something happen by this summer, I would think. We have some nice young skill players, as do a number of other teams. But it's a start. Surrounding them with strong two-way players who will also bring leadership may be important as well. It's a lot to expect our "kids" to lead while they're still learning on the job. Some good veterans should only help. I was thinking recently about gap between championships. I agree, next year would be a good time to be a playoff contender again. If management continues to build through the draft as they have, there may be better days ahead. But time will tell.